We may have finally seen Faraday Future’s sort-of-working cross between a Toyota Venza and a robot suppository, but we’re still waiting for the most anticipated car news of 2017 to break. And waiting. And waiting. 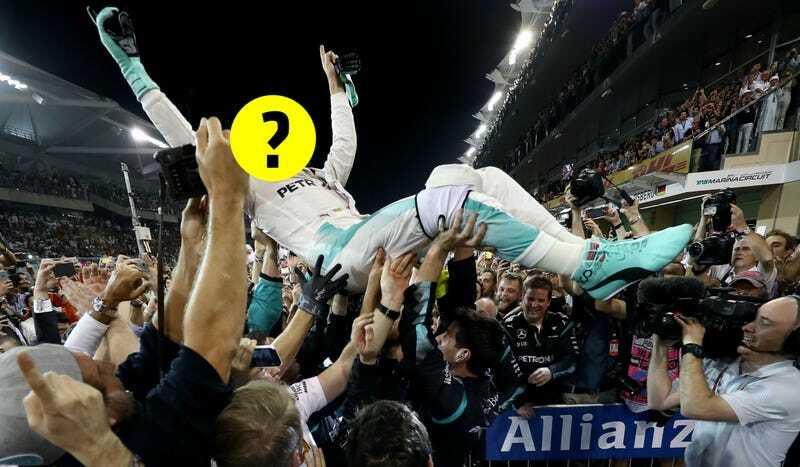 Come on, Mercedes: tell us who your new Formula One driver is, already. That’s right: despite all of the rumors and rumblings, we still don’t have any official confirmation that up-and-coming Finnish driver Valtteri Bottas will be taking over the Mercedes Formula One seat surprise-vacated by 2016 champion Nico Rosberg. Le sigh. What we have in the meantime are bits and pieces that hint at who won’t be taking that seat. First, still-unconfirmed rumors leaked out that Felipe Massa may come out of retirement to drive for Williams, heavily suggesting that one of the Williams drivers—and it sure isn’t Valtteri Bottas’ young rookie teammate Lance Stroll—is going to Mercedes. Now, Mercedes test driver Pascal Wehrlein—one of the other, non-Bottas names linked to Rosberg’s former seat—has signed on to drive for perpetually struggling backmarker Sauber instead, reports Motorsport.com. Thanks for the confirmation that Rosberg’s replacement won’t be Wehrlein, Captain Obvious. Although Mercedes is pushing on hard with its car, it has yet to finalise its driver line-up – as discussions continue between itself and Williams about a potential deal for Valtteri Bottas to replace Nico Rosberg as Lewis Hamilton’s teammate. What, are these continuing discussions over what size of Petronas turquoise footwear he wears? Technical input on this 2017 car? Preferences in brefass scotch? Please advise. Either way, don’t make us wait until February 23 for that. Won’t somebody think of the bored Formula One fans out there, who have nothing else to wake up for except this news right now? Please, just go ahead and confirm the worst-kept secret in the automotive world so we can throw some confetti in the air that we’re totally not saving just for this purpose from New Year’s like a bunch of weirdos, toot the horns, deliver the customary shoe-toast of our people and then go on with our lives. Thanks!! !